What the festival had plenty of was supermodels and other influencers; what it lacked was everything else. Ja Rule may have hoped that the memory of Fyre Fest had long been swept away, to be lost amid all the other Twitter and Instagram scandals that succeeded it. He may have hoped that that sad cheese sandwich tweet had all but been forgotten. But unfortunately for him, and fortunately for us, people are being reminded of the disaster that was Fyre Fest all over again, with the recent releases of the Netflix documentary, Fyre: The Greatest Party That Never Happened, and Hulu’s Fyre Fraud. The Fyre Fest, for those who haven't seen the films or read the news accounts, was a failed attempt to hold a music festival in 2017 on the Bahamian island of Great Exuma with the larger goal to promote the Fyre music booking app. The two documentaries recounting what happened teach us valuable lessons beyond how hard it would have been for anyone to pull off a “luxury” music festival in just a matter of months, and how any promoter should forever steer clear of severely over-promising and under-delivering. They teach us about more than why it's a really bad idea to defraud investors out of $24.7 millions and get sentenced to six years in prison, as happened to the festival’s founder and CEO, Billy McFarland. The docs also teach us the sheer power -- and the very serious possible ramifications -- of influencer marketing. Influencer marketing helped Fyre Fest sell 5,000 tickets at prices anywhere between $500 and $12,000. But does that mean the Fyre Fest team was great at influencer marketing? Nope. While they may have gotten a lot of eyes by using Kendall Jenner, Emily Ratajkowski, Bella Hadid and other social media influencers to promote their festival, those women's power was also part of what made the fest such a failure. 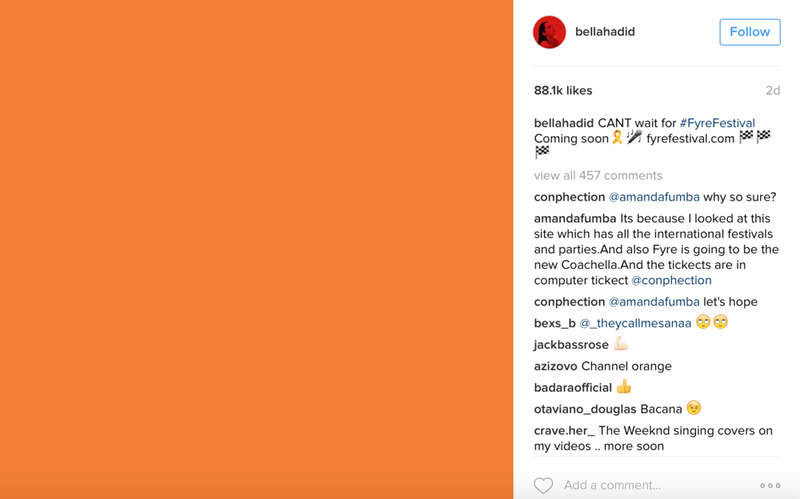 Leading up to Fyre Fest, numerous Instagram influencers were paid to post mysterious, now-infamous orange-colored posts to promote the music festival; Kendall Jenner was reportedly paid $250,000 by wire transfer for just one single social media post. The problem was, consumers weren’t made aware that these influencers were being paid to promote Fyre Fest. This lack of disclosure was a direct violation of the Federal Trade Commission’s truth-in-advertising rules. These FTC standards are in place so followers are aware when influencers are recommending a product they’re getting paid for -- not just because they like it. These regulations allow consumers to make a more informed decision as to whether they want to spend their hard-earned money on the product/service or not. The general rule of thumb is to add to the post “#ad” or “#sponsored” o abide by FTC rules and not mislead your audience. False promises seemed to be the theme of Fyre Fest and its influencer marketing. A number of supermodels and influencers were flown out to the sandy beaches of the Bahamas by McFarland, for a weeklong promotional video shoot to be released ahead of the festival, as well as for a photo op for social media. These videos and photos were made to look organic, as if to say: "This is what ticket-holders to Fyre Fest will be experiencing along with these influencers!" The video and those photos were used for weeks leading up to Fyre Fest, even when its staff knew the festival would look nothing like the images they were sharing. An example: Attendees expected to stay in luxury villas, but what they were given were tents. They were told they they'd get a “branded jet experience” but what they got was a commercial 747. They were promised gourmet meals and instead given a piece of cheese between two slices of bread. Both the company and the influencers promoted false promises, regardless of their motive, when they should have been promoting the festival in a realistic and authentic way. There’s a downside to working with influencers who have millions of followers, especially when the beneficiary is a brand new company. Instead of shelling out a ton of money to pay for Instagram influencers with a gigantic following, companies should consider spending less money and getting a better return on investment by working with micro-influencers. Because of their smaller audience, these micro-influencers tend to have a higher engagement rate and are more likely to interact with their audience directly to promote the product. Plus, micro-influencers are more relatable to consumers than the celebrity influencers known as the “Fyre Starters.” Plus, according to statistics from Social Media Today, the average cost to hire a micro-influencer is $180 per post, whereas a macro influencer costs on average $250,000 per post. Choosing micro-influencers could have saved Fyre Fest millions of dollars and still likely sold tickets. Don’t put all your eggs in one influencer basket. Right from the start, Fyre Festival seemed to put all of its eggs in one influencer basket. Instead of first working out all the logistics of the festival, its organizers went straight to hiring a ton of mega influencers to promote a vision they hadn’t even realized yet. In fact, all of the influencers (about 250 of them) were promised housing at the Fyre Festival for free: a one bedroom, three-person villa on the beach that didn’t even exist. Fyre Fest was so focused on working with influencers that organizers would say and do anything to make it happen. Not to mention the fact that they blew a ton of their money -- some, their personal money -- on influencer marketing, rather than on housing, water, food, workers and amenities essential to any outdoor festival. Having the most popular celebrities and influencers promoting your brand isn’t what will make your company a success, and it’s a shame the people behind Fyre Fest didn’t realize that. What’s more important than working with influencers is to first figure out all of the logistics you need to, to provide customers with a satisfactory experience that meets the expectations you’ve set forth -- and can definitely deliver on.